Luck has nothing to do with it. This is a method that absolutely works. Mark Sonder, MM, CSEP and the Chief Entertainment Officer at the award winning music and entertainment talent agency Mark Sonder Productions is proud to announce the representation of seven time lottery game grand prize winner and author, speaker Richard Lustig. 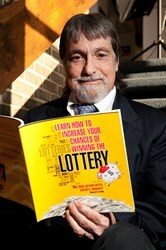 Lustig's lecture entitled, "Learn How to Increase Your Chances of Winning The Lottery," the title eponymous with his book, is now available to present to your meeting, convention, trade show, exposition, casino or other special event around the USA. In January of 2012, Powerball implemented a new game redesign that increased a player’s odds of winning a prize, but decreased the possible number of combinations to win. As a result of the redesign, lottery officials say that jackpot totals will continue to climb in shorter amounts of time. More than half of the all-time jackpot record amounts have been reached in just the last three years. One guy who knows what it feels like to win big is Richard Lustig. Lustig is very well known at his state lottery offices; he’s visited dozens of times to collect prize-winning checks, including an unmatched seven lottery game grand prizes! "My family and I are very thankful,” says Lustig. “Not lucky, but thankful. Luck has nothing to do with it. This is a method that absolutely works." How well does the method work? Recently, an Iowa man and his wife pocketed over nine million dollars after following Lustig's winning lottery method. A Tampa area couple who followed Lustig’s strategy won a lottery game grand prize of over two million dollars. Dozens of others have written to Lustig to tell him about their winnings. Richard’s amazing story has even captured the attention of Ripley’s Believe It Or Not, which featured the lottery winner in a newspaper article. Not surprisingly, Richard has been asked to share his winning lottery method by speaking to groups around the USA and has written the book "Learn How To Increase Your Chances of Winning the Lottery," which details exactly how he does it. To have Richard speak to your group, please contact: Mark Sonder Productions - Mark Sonder at 540-636-1640 or msonder(at)marksonderproductions(dot)com. Mark Sonder Productions is a privately held company that was founded in 1985. It’s an award winning entertainment agency, which has more than 28 years of contracting experience, specialized in events, meetings, conventions, trade shows, expositions, concert and casino facilities worldwide, as seen in The Boston Globe, The San Francisco Chronicle, The Miami-Herald, United Press International, as well as on FOX and CBS Money Watch. Mark Sonder Productions offers exclusive and non-exclusive relationships with headliners, musicians, comedians, theatrical productions and lecturers. The chief entertainment officer, Mark Sonder, is an entertainment industry expert and he has represented clients and end users in the U.S.A. and abroad.